Caffe Amore is located on the corner of Pulteney and Pirie St in the heart of Adelaide's CBD, overlooking Hindmarsh Square it offers a relaxed and stylish dining experience. 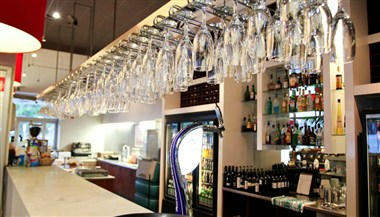 Cafe Amore offers two levels of dining experience to cater for any special occasion. Downstairs for a sit down function or the upper mezzanine level for a private sit down or cocktail function. The upstairs private function room is equipped with its own bar, sound and entertainment system and can be booked morning, day or night. It accommodates up to 50 people seated or 110 standing to enjoy a number of functions. Opening Hours are Monday to Friday 7am til late, Sat and Sunday 8am til late.